Kleefeld on Comics: December Sale Embiggened! I know what you're thinking! You're thinking, "Oh great and beneficent Kleefeld! 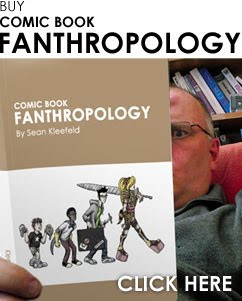 I have been greatly enjoying the serialization of your new book, Comic Book Fanthropology, and I am terribly eager to procure a printed version for my library. Oh, but woe, I have not sufficient funds to purchase one! While I am eternally grateful for the 10% discount you provided last week, it is not quite sufficient for me to secure a copy. Perchance could you provide a greater discount?" Well, since you asked nicely, I suppose I could muster up another discount. Tell you what: if you buy my books before December 31 and use the codeword HOHOHO when you check out, you'll get 20% off the cover price! Think about that: twenty percent! How could you NOT want to take advantage of that? But the discount's only good through the end of the month, so don't dally too long!